The iHealth Wave is a fitness and swim tracker in one that goes beyond the basic pool performance metrics you get with the majority of waterproof trackers. It'll record stroke type, number of strokes and calorie burn. That's alongside the usual activity tracking basics of counting steps and automatically monitoring sleep to give a more comprehensive outlook of your day (and night). 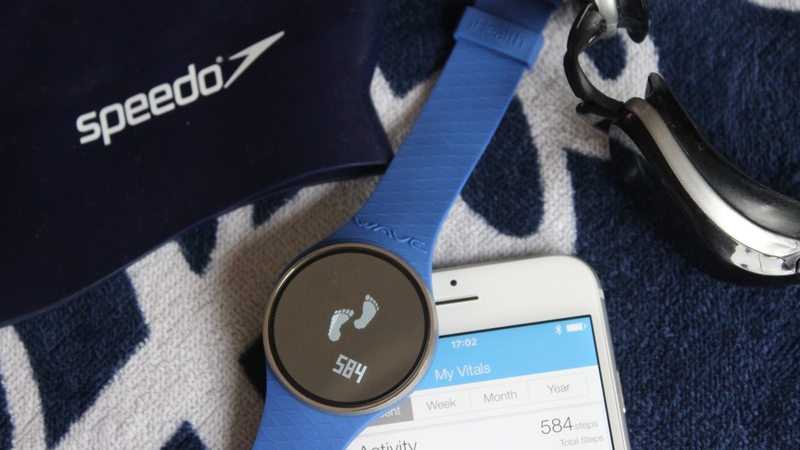 At $79.99, it's competing with swim friendly trackers like the Misfit Speedo Shine and the Moov Now. The big difference with the Wave is that you've got a screen to view your tracking progress from your wrist. You can buy dedicated swimming watches like the Garmin Swim and the Poolmate Pro for around the same price, but you'll miss out on the daily tracking features. We've been living with the Wave for a few weeks now to see how it fares on both land and in the water. Here's our comprehensive verdict. As far as looks go, the Wave sides more with the sporty-style trackers than the Misfit Rays and Fitbit Altas of this world. You won't get great looks of admiration when it pops out from your shirt sleeve, but it does feel like a solid, well-built and robust piece of wrist wear. It's made up of a silicone strap that feels very similar to the one you get on a Fitbit Charge or Charge HR with a watch-style buckle ensuring this isn't going to budge from your wrist. In the box you'll get the option of black or blue straps and swapping between the two is pretty easy. It's a simple case of pulling the strap over the screen. The blue option is definitely nicer looking, but there's not a lot to choose between what are essentially two pretty ordinary looking bands. Front and centre is the circular OLED touchscreen display with a mirror-style finish that means it has some visibility issues outdoors but it's fine indoors and underwater. At first glance, it looks like a decent sized screen with plenty of space to view data. Get a little closer though and you'll notice that a lot of that screen is not actually being used and it's actually just a strip in the centre that can be activated by taps and swipes. It also makes switching through screens quite frustrating as the sweet spot is much smaller than it first appears. You do also have gesture support here, so you can flick your wrist to turn the display on and perform the same action to flick through the data screens. The problem is that the flick needs to be quite vigorous. I wore it against the Fitbit Charge HR, which offers a similar feature and the Fitbit tracker was considerably more responsive. Around the back of the screen is where you'll find a three pin charging port, which does mean the Wave comes with its own proprietary charger. It clips onto the back securely but keeping it somewhere where it won't get knocked about is definitely advisable. Wearing it on a daily and nightly basis is no problem. It's light, not at all bulky and thankfully didn't experience any skin irritation issues. The slender frame makes it ideal for swimming as well as it doesn't weigh heavy on the wrist either. All of your tracking data is stored inside the iHealth smartphone app that's compatible with iPhones/iPads running iOS 6.0 and above or Android devices running Android 4.4 or later. We paired it with an iPhone 6 and the Huawei P9 and it was a relatively consistent experience. Both apps offer similar UI experiences and we didn't any syncing issues testing across both platforms. The app itself is built for all devices in the iHealth family, including its smart scales and portable pulse oximeter. Once you've negotiated yourself through a standard fitness app setup process, it favours displaying data in progress graphs. There's also tabs breaking down trends and a list of all the logged activities. The dropdown menu tucked away in the top left hand corner hides away seeing your vitals, which combines readings from all of your synced data. There's also sections for blood pressure readings and weight and a settings section where you can adjust target goals, set up reminders and turning on the Apple HealthKit integration. As far as the Wave is concerned, you can also set up sleep alarms, inactivity alarms and turn on the Swim mode. The latter is pretty important as we'll explain in the tracking section of our review. Compared to Fitbit, Jawbone or Misfit's companion apps, the iHealth app just doesn't feel as vibrant or enticing a place as rival apps. There's also a sense that you need to jump around more to get to the data you need. It feels more like a hub to cater for all of the iHealth devices and not just the Wave and that definitely comes across. It's generally a very slick app, but other apps currently do a nicer job of displaying your data. The Wave's big feature is the swim tracking, so that's the best place to start. Before you hit the pool, you need to make sure you've switched on the swim mode in the iHealth app, if you want the tracking to kick in. Once that's done, you can start swimming. My first problem is that the Wave doesn't appear to detect swimming until about a minute or so into a session as I found comparing it to the TomTom Spark's swimming mode. Only then will the tracker indicate that the recording has begun by flashing up a swimming icon on the Wave's display. As you swim, you can see duration but nothing more. You'll only be able to see the additional metrics once you've synced it to the app. Inside the app, you can see the number of strokes, strokes per minute, calorie burn and a break down of the type of stroke. The Wave is able to detect breaststroke, freestyle, backstroke and 'Other' strokes, although I'm not quite sure what constitutes as an 'Other' stroke. Compared to the data recorded by the TomTom Spark, you can see that the strokes per minute, calorie burn appear very different. That's pretty representative of my experience with the Wave over several sessions. You can also see the couple of minutes difference in the duration, which emphasizes the slow swim detection. The type of stroke does however appear accurate as I do spend the majority of my time performing the breaststroke and freestyle modes. I do not however spend anytime doing backstroke so it's not clear how that data was recorded. As far as standard activity tracking, it does a solid job. Along with the time, you can view distance, step count, calorie burn on the Wave display. There's also a small podium icon to show you how close you are to your daily target goal. For step tracking I compared to the Fitbit Charge HR and there was generally a difference of 300-400 steps. It's in the right ball park and that's the best we can ask from two trackers that use their own separate algorithms to calculate step tracking data. It's a similar story with the automatic sleep tracking where you're simply getting a break down of deep and light sleep. What I did notice is that my walk from the office to the train station was continually recorded as a workout while leaving the swim mode switched on means gym workouts are registered as a swim. As far as keeping you motivated to stay active, it possesses one of the strongest vibrating inactivity alarms I think I've used on a fitness tracker and it definitely does the trick of reminding you to keep moving. There's nothing in the way of helping you make sense of the data. Something you can criticise the majority of fitness trackers of. In our testing, the Wave can manage to stay powered for a pretty decent two weeks. This does of course depend on how frequently you're putting the swim tracking to use and whether you're taking full advantage of the silent and inactivity alarms. Regular 40-50 minute swimming sessions is likely to see that reduced to closer to a week, but we were satisfied by what it delivers in this department. As a fitness tracker, the iHealth Wave is solid but doesn't offer anything out of the ordinary. It's really all about how it performs in the pool. While it does offer more metrics than similarly priced fitness tracker built for swimming, it still feels a little light on features and there's definitely question marks over the accuracy. The lack of distance recording is a strange omission as well and the swim detection is by no means the quickest. It might appeal to casual swimmers, but those more serious about their pool time will be better off spending a little more for something more comprehensive.